At every place that we operate, Mewah partners with the local communities to support the particular needs of the community. We contribute regularly to local charities. Our people organise and participate in social events to support and bring joy to the less fortunate in our nearby community. Our goal is to enrich the lives of the people around the touchpoints that we have established. We believe that every child deserves a chance at a life filled with love, laughter, friends and family. Every year, a number of fund raising activities will be held internally and externally to distribute funds, groceries and stationeries to children via charitable organisation. Our efforts are not only directed at alleviating the disablement of the less fortune children but also at giving the child a hope for the future. "Not all of us can do great things. But we can do small things with great love." -Mother Teresa. We believe that everyone can contribute and make a difference to the community and lives of others. We encourage our staffs to volunteer and give back to the community. Therefore we hold companywide community volunteer to facilitate our staffs’ participation in community events. 1) Save Lifes - Blood Donation Campaigns. We wish to support the communities that we operate in. One of the most important initiatives is to help our neighbours in their time of need. 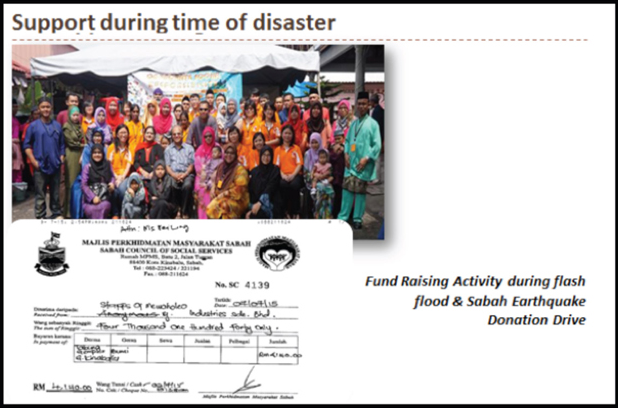 When there are natural disasters in our neighbourhood, we raise money and donate basic necessities to support victims of natural disasters.